“The question of those who never hear the gospel is often emotively framed as those who do not hear ‘through no fault of their own.’ This claim rests on the assumption that those without special revelation are not responsible for their lack of special revelation, hence the pressure falls on general revelation to provide sufficient knowledge. However...both theologically and historically the precise opposite is true...If general revelation and special revelation were, in the preceptive will of God, always meant to be understood together before the Fall, and if special revelation is even more necessary after the Fall to correct and interpret general revelation, then if there are those in history who only have general revelation, are they not those who have fallen outside of God’s preceptive (but not decretive) will? Despite protests as to the narrowness of those who fall within special revelation, historically speaking we have seen that there was a time when special revelation was indeed as universally known and accessible as general revelation. The entrance of sin has consequences for the accessibility of revelation” (Daniel Strange, “General Revelation: Sufficient or Insufficient?” from “‘Faith Comes By Hearing’: A Response to Inclusivism” by Christopher W. Morgan and Robert A. Peterson, eds. Downers Grove: InterVarsity Press, 2008, page 71). 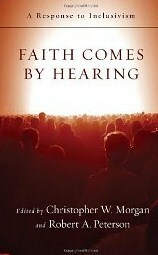 I bought the title “Faith Comes By Hearing: A Response to Inclusivism” several months ago. I had heard of inclusivism through my introductory theology course with Dr. Ken Keathley, author of “Salvation and Sovereignty: A Molinist Approach” about a year and a half ago. Seeing the book on the shelf at the local bookstore, I was moved to buy the book. I wanted to know the inclusivist arguments and the exclusivist response to them. In addition, I had never had the chance (at that time) to research inclusivism. At the time I took Dr. Keathley’s introductory theology course, I researched the divine sovereignty-human responsibility debate. I always thought, “If I could retake my introductory theology course all over again, I would research on inclusivism.” Little did I know that I would pursue independent research with Dr. Keathley by the end of my Master of Divinity degree...and that I would get to research the debate I had been longing to research two years later. The Lord always has perfect timing on these things. “Paul is not, then, simply using the text according to its original meaning. His application probably rests on a general analogy: as God’s word of general revelation has been proclaimed all over the earth, so God’s word of special revelation in the gospel, has been spread all over the earth. His intention is not to interpret the verse of the Psalm, but to use its language, with the ‘echoes’ of God’s revelation that it awakes, to assert the universal preaching of the gospel” (Douglas Moo, “Epistle to the Romans,” pp. 666-667; quoted by Daniel Strange, “General Revelation: Sufficient or Insufficient?” from “Faith Comes By Hearing,” page 64). I think Strange handles Sanders’s dissent on Romans 10 very well. Exclusivists need to learn good arguments and how to defend the truth of the Scriptures. Sanders (and inclusivists) makes, on the surface, a very appealing case for general revelation with the reference to Psalm 19. However, in the context, it is “the word of Christ,” “the gospel” whose voice has been heard to the ends of the earth, not general revelation. The words regarding universality come right after the verse for which the book itself is named: “So then, faith comes by hearing, and hearing by the word of God” (Rom. 10:17, NKJV). But I’m not so sure about Strange’s words regarding the lack of universal access to special revelation as a consequence of the fall and sin. Strange quotes Gerald McDermott’s words about a “Religious Law of Entropy” where access to special revelation has been dying throughout world history. According to McDermott, there was a time when knowledge of God was universal; today, however, we discover that some areas of the world have access to the knowledge of God concerning Christ while other parts of the world do not. Why is this? According to Daniel Strange (and Gerald McDermott), this exists because “the entrance of sin has consequences for the accessibility of special revelation.” In other words, when the Fall happened (Genesis 3), it affected even the spread of the gospel (which is the revelation of God in Christ). As a result, some will experience this special revelation while others will not. Take the example of the man born blind from birth (John 9:1-3). Was this man born blind because of his sin, or the sin of his parents? No. But the man’s blindness would be cured so that God’s glory could be displayed (9:3). In the same way, I would say that the lack of special revelation around the world is not because of the sin of the nations, or because of the sin of every human in Adam. Rather, God desires that the gospel reach the ends of the earth (Matthew 24:14; Mark 13:10), and the gospel itself will do so, since God has decreed it (see Revelation 14:6). If God desires that the gospel reach the ends of the earth, then the current situation just leaves room open for God to display His glory by how He brings men and women to faith---not just the preached gospel but by dreams and visions, as He is currently doing in the Muslim world. I think that Strange has to prove that the fall affected special revelation. I think that the fall of Genesis 3 has affected human nature, such that we are depraved in every human way (hence, radical depravity). However, I’m not sure that the Fall affected special revelation. This is an assumption that has to be proven if Strange intends to convince his audience. “Instrumentally the withdrawal of special revelation from a people, with its important corrective to salvifically insufficient general revelation, is already a demonstration of God’s righteous judgment, a cyclical degenerative process of sin and judgment continuing over generations. In other words it is precisely ‘through their own fault’ that some may find themselves devoid of special revelation and the gospel” (Strange, “General Revelation,” from “‘Faith Comes By Hearing: A Response to Inclusivism,” page 72). The above statement regarding those who have yet to see a human messenger preach the gospel of Christ must be proven. The unevangelized are called “unevangelized” not because they have refused to hear the gospel, but because no one has gone to preach it to them. In many places, governments have refused to allow the preaching of the gospel within their borders or withheld missionaries from entering. Somewhere in this world at this very moment is a devout Hindu who has never heard the gospel---and in some cases, has never been allowed the opportunity to do so. Before Strange can just assume that many are to blame, he should look at the current climate around the world. Last but not least, if Strange’s assertion is correct, NONE of us, no human being on planet earth, would ever receive special revelation. After all, have we all not sinned (Rom. 3:23)? Are we not all guilty under the law (Rom. 3:20)? Is it not true that none of us are righteous? If all are made guilty under the law, why then, must some individuals be declared eternally damned while the rest of humanity is allowed the chance to be saved? Did God not love the world and give His Son for it (John 3:16)? The fact that the West has received the light of the gospel serves as a reminder to the Eastern portion of the world that God loves them too and desires that they (the East also makes up the “all men” of 1 Timothy 2:4) be saved and come to the knowledge of the truth. If the world as a whole bears “corporate responsibility” for the entrance of sin (See Strange’s article, “General Revelation,” page 72), why shouldn’t the world be given a “corporate opportunity” to hear the gospel and receive it or reject it? I applaud Daniel Strange for arguing that Christ is the only way to salvation and that general revelation does not save; however, at the same time, Strange is very pessimistic about the nations coming to faith because of his Calvinist presuppositions. I will dive into what those are and how they affect his view of the universality of special revelation in my next post. I have this book and like you enjoyed it. What a good book. The writers did an excellent job of presenting a clear and biblical understanding of both the gospel and why it is necessary to evangelize all nations. Without the gospel, none will be saved. This is the point of Romans 10:14-17. I did enjoy the book. I enjoyed it so much that I highly recommend it to every inclusivist I come into contact with. I'll post more on inclusivism in the days to come...so stay tuned!